This is a recipe for Dill Pickle Dip. Made creamy with Cream Cheese and Sour Cream and the star of the show, chopped dill pickles. A delicious and easy appetizer recipe for any party or game-day event. 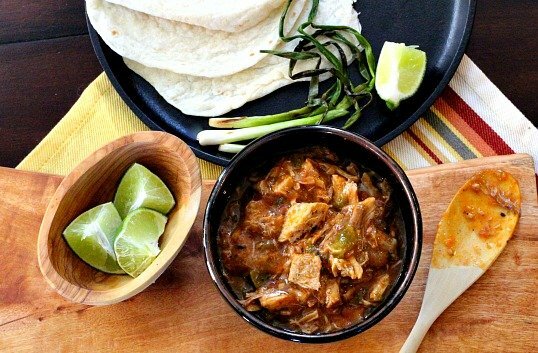 This is one of those recipes that I just had to try… just out of sheer curiosity. I’d never heard of such a thing. Dill pickle dip? Odd but interesting. Quirky and tempting. Crunchy yet creamy. Tart and salty. I found this recipe over at CopyKat Recipes. Thanks so much Stephanie, this is a great dip. While taste testing to adjust flavors, I decided it needed more pickle, more pickle juice and a bit more onion. For no other reason other than I’m a pickle and onion freak-0. I made this dip the morning we were heading over to Maralee and Greg’s for the big AFC Championship game that afternoon…let me pause here for a Go Broncos!…and it was delicious the same day. And just as the direction say, it’s better if it sits overnight. I found a similar recipe over at the blog Smells Like Home, using Greek yogurt. The Iowa Beef Council Industry thinks we ought to add dried beef to the recipe and serve it with vegetables. Sounds good to me. However you mix it up, you’ll need a sturdy chip for dipping and elastic waist band pants for this one. 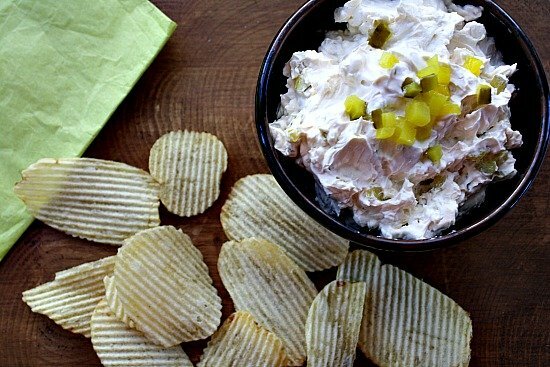 I hope you give this dill pickle dip recipe a try, and if you do, please come back and give the recipe a star rating. And leave a comment about your experience with the recipe. 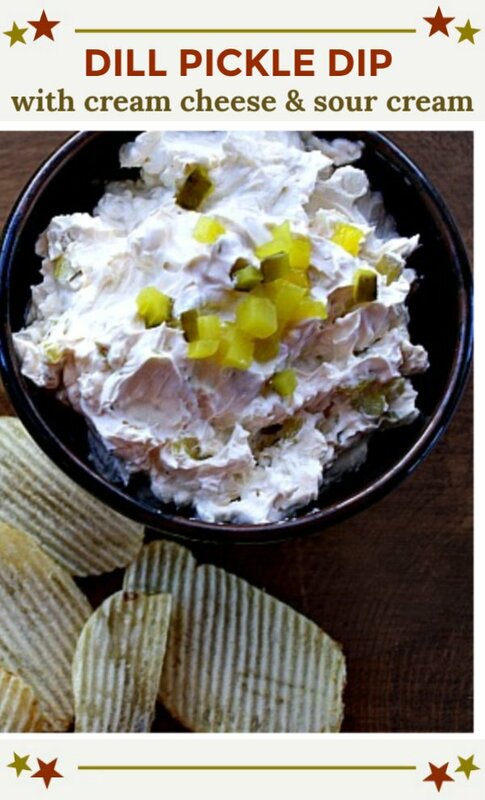 And if you have a favorite cream cheese pickle dip recipe, let me know, I’d love to give it a try. Allow cream cheese to warm to room temperature to soften. In a medium sized mixing bowl mix together cream cheese and sour cream. Stir until well blended. Add in chopped white onion, chopped dill pickles, and Worcestershire sauce, and mix until you have a uniform mixture. You may add in 1 to 2 teaspoons of pickle juice if desired, it will give the dip a little extra zip. Store in an airtight container for at least 1 hour before serving. This is better when made the night before. Garnish with dill if desired. 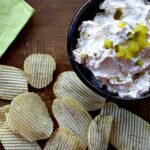 Dill Pickle Dip …It’s what’s for Super Bowl. Let me know how you like it Heather. 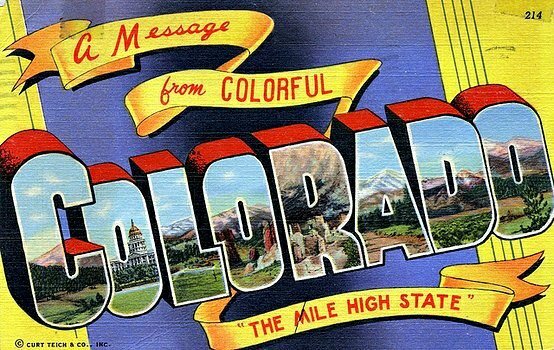 Go Broncos. Wow! Never thought of a dip with this flavor. This is awesome! Thanks so much.